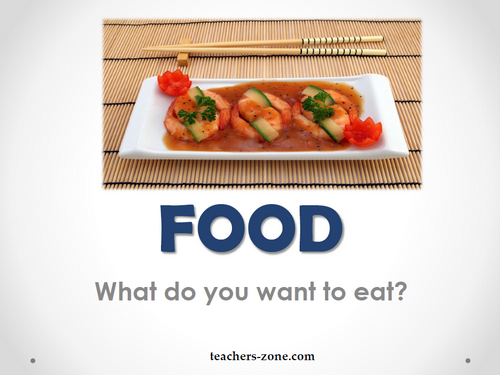 Teach your students new vocabulary for food and encourage them to talk what they want to eat. Materials: food flashcards, wordcards, worksheets. - Students sit in the circle. - Put the flashcards on the floor, say the names of the food items and ask students to repeat them. - Turn the flashcards face down, point to each card and ask students to guess what is at the picture. - Students read the names on the wordcards and match tem to the right pictures. - Ask yor students: Do you want ...? to answer: Yes, I do. or No, I don't. - Then ask : What do you want to eat? and students answer: I want to eat ... and get the right picture. 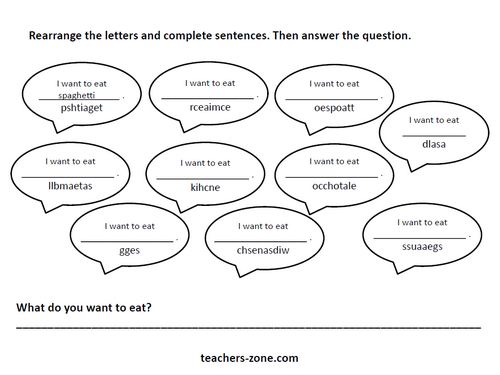 - Students complete the worksheets and then write what they want to eat. - Students in pairs make small talks asking and answering questions: Do you want to eat ...? and What do you want to eat?